Backed by a reputed client base in this domain, we are specialized in offering a sound range of Sequin Embroidery Machine to the deemed patrons. These offered machines are fabricated in compliance with the industry laid parameters at the credited vendors base. To develop a significant range, a team of skilled employees is recruited, who follow leading market strategies that enables us to muster patrons needs and demands in a suitable manner. In addition to this, we offer these machines to the patrons in diverse sizes and other detailed specifications at market leading prices within the stipulated time frame. 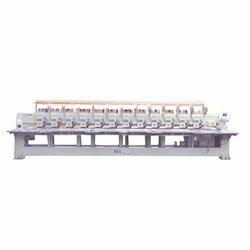 We offer a quality array of Multi Head Computer Embroidery Sequin Machine to our valued clients. Offered range is praised for its quality construction and easy maintenance. These machines are suitable for USB connectors and spare parts that are accredited for usage in various industries and sectors. Manufactured using high grade raw material like bobbins, rotary tools and hooks for our BLL - Sequin 612, these machines are available with us in various sizes and grades. Looking for Sequin Embroidery Machine ?